Thank you for sharing this. My grandson loves it. Is there any thing to replace the custard powder? can i replace custard powder with instant custard powder ? should i still using the measurement i.e. 20g ? Is your instant custard powder pre-mixed with milk and sugar? If so, you can't use it for making these cookies. Sorry, I haven't used combi-microwave oven or tried this recipe with it. should I put less butter or more 'something' into it? Hi christine, just wondering what does the custard powder do ? Is 玉米粉 corn flour or corn starch? 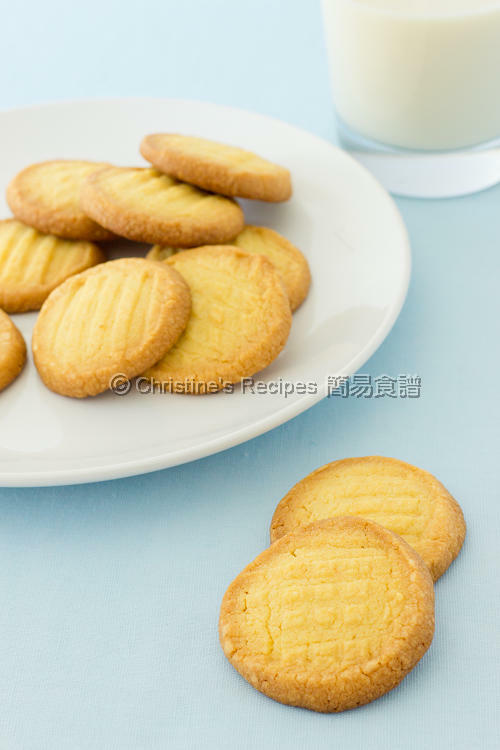 The custard powder will help produce a yellowish colour for the cookies. Yes, it's right. 粟粉（玉米粉） is corn flour or corn starch. is there any difference between all purpose flour and self rising flour? You might replace the all purpose flour with self raising flour, remember to omit the baking powder. thank u very much Christine. Hello Christine, I have all ingredients except custard powder, can I replace custard powder with others? *Is this step require the folding method? Or using the electric mixer? *Place it at the frozen compartment or the chiller? *I don't understand this step. 切口向上的意思是? Can you elaborate more? Thank you. Thank you for the recipe. I've tried twice, but it still very sticky. It stick on the food wrap paper everywhere. I saw your picture that your food wrap paper look so clean. Is it I shouldn't mixed too well with all powders with the butter? Even it looks solid after I put into the fridge but it will melt when I bake in the oven. Is there any tips? Thank you. The dough shouldn't be too wet or sticky. Don't over knead it once you add the flours. Just combine all ingredients and that's it. Move quickly and chill the dough if you find it becomes too greasy. 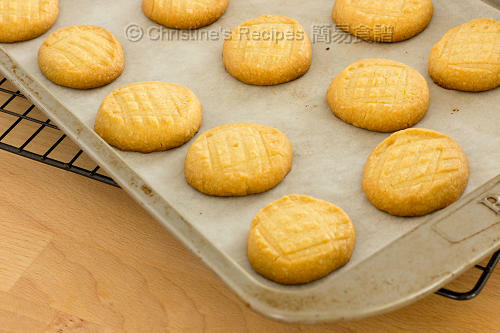 If your cookies melt while baking in oven, it tells your dough is not right in the first place. 多謝你的分享, 我依照你的食譜做了, 很成功, 家人都好喜歡這款曲奇呀, 好味道! I made this last week and it's gone in 2 days! super easy and yummy! I also tried the green tea version (1tbl green tea powder), not bad. but will have to reduce the heat or baking time... mine was a bit burnt lol. Thanks a lot for sharing this!!! will make it again and again! what is the different between instant custard powder and custard powder? Instant custard powder might have premixed with some other ingredients. Please check the ingredient labels on the packaging. hi Christine, 請問是落baking powder or baking soda? 我見你有D其他的cookies是落baking soda. 因應不同材料和期望的效果，會用 baking powder 或 baking soda. Is icing sugar same as confectioners sugar? Thanks! Yes. It's in powdered form. Thanks for this recipe! It's really nice! I've been trying to find this recipe for very long time already and yours are exactly what i want! 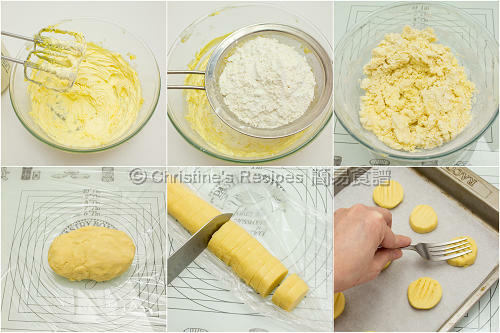 But the dough is a bit greasy and sticky, it would stick to the plastic wrap and knife while cutting. The dough would also stick on the fork while i want to press it for some pattern, any way to solve it? grease the fork & knife with butter or oil? Highly probable that the butter was melted so your doug was too sticky and wet. In such situation, wrap the dough and chill it in fridge until it's workable again. Please refer the second point of "溫馨提示". Hi Christine, I really like all of your recipes and the steps are clear and easy to follow. I tried to make the cookies and it was successful and yummy. My two kids loves them so much. I will definitely bake it again. So glad that you and your kids liked these cookies. I am totally new in cooking/baking. I want to know how long I have to pre-heat the oven. It takes only about 5 to 10 minutes to heat up your oven, depending on the size of your oven and temperature you want. 朋友個個都很喜歡 , 還加了朱古力粒 & 另一款加了即磨咖啡粉超香啊! !